Secondly, the handle construction is not conducive for heavy-lifting. The handles themselves are strong, but where they attach to the bag is not. If you choose to attach the handles to rings and the rings to the bag, please make sure to sew through a piece of fabric on the inside of the bag when attaching the rings. Had I not done this, the rings might have ripped right off my bag. :O As it was, I “snuck” my heavy items, like my books, into one of my girls’ carry-on suitcases and left the lighter items, like my knitting and some snacks, for the satchel. I did slip my MacBook inside, as well. 🙂 Had I to do this part over again…well, I would have changed the construction of the bag itself. There is a great method out there for binding off the top edge of a bag called the knit-cord bind off. Working this bind off three times (which will require you to pick up the stitches you just bound off) creates an extremely durable top border through which straps will not break (the straps would break before the edge ever would). It does mean the handles would slip through holes just beneath this bound off edge instead of being sewn to the side of the bag, which changes the bag’s overall appearance…but increases its strength. Another idea is something along the lines of the picture at the right. If you make the loops horizontal and have the straps running up and down and around the bottom of the bag, you would have one strong travel bag at your service. 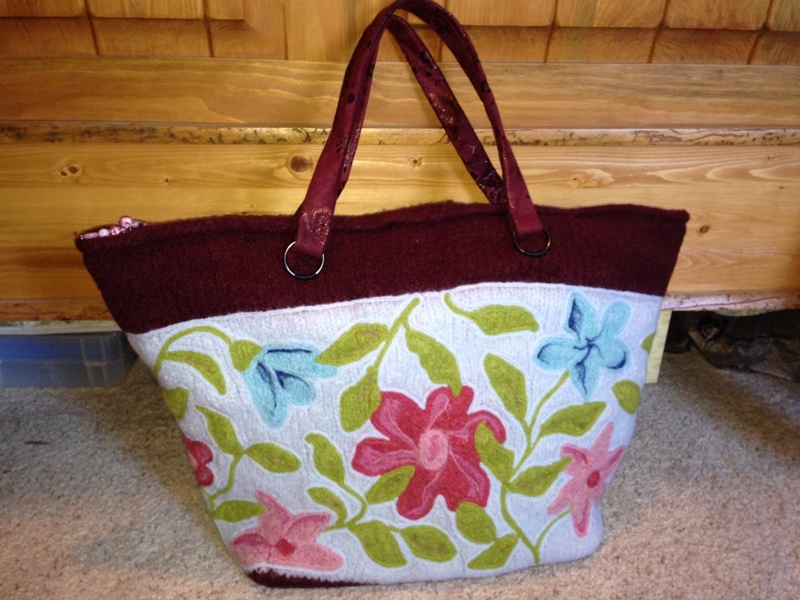 It would take some pre-mediation before knitting the bag to figure out where you would place the loops for the straps and the straps themselves would interrupt the bag’s pattern, but the end result might be worth it. So really, aside from the handles, this bag worked great. I would recommend it as a challenging knitting/felting project—provided you don’t try to watch TV or a movie at the same time!—but I would highly suggest figuring out ahead of time how you want to handle the, uh, handles. 😉 And if anyone has another suggestion for working those handles, I would love it if you left a comment below! Finish the Ravenna Satchel: check! I’m sure some of you might be wondering if I’m ever going to follow-up with a post about the felted bag I had worked on over the summer. Well…I finished it! Yay! After I completed the needle-felting process a few months ago, the bag sat in a corner of my bedroom as life sped up around it. At one point, I sewed the zipper along the top edge. On another day, I added the feet to the bottom of the bag. And then I had to sew the handle rings to the outside of the bag. This part—the handles and how they’re attached—is where I will probably change things when/if I make another one of these bags. To offer a woman such a nice big bag (and it is big!) with such spacious real estate inside just begging to be filled and utilized…and yet to construct it with a weak handle system…well, a bag is only as good as the strength of its handles, right? In order to give the handles more stability, I sewed through a square piece of fabric on the inside of the bag while sewing the rings to the outside of the bag. That way, when the bag is hanging off my shoulder or dangling from my hands, the weight is not just pulling my felted yarn, but also the piece of fabric (now hidden by the inside liner). It’s amazing the difference that created—because, yes, I attached the first ring without the fabric and my eyes bulged when I saw how it would pull on the sides of the bag! Here and there throughout the autumn months, I worked on the inside lining of the bag—cutting the fabric, cutting the interfacing (the iron-on kind), cutting the MDF board (for the bottom of the bag), sewing everything together… Mind you, I had no pattern to follow, for a lot of the extra online information one could have found on this bag six years ago is no longer available, so I had to make up my own based on how I knew the bag itself was constructed. In the end, the liner’s girth was an inch or so wider than the interior of the bag—but with a little folding and the help of a curved upholstery needle, I was able to tack the sides of the lining to the bag in four different places with a running stitch from top to bottom. I finished that, along with my little zipper pull, during my daughters’ Christmas break. Thus, for the past few weeks, I’ve had only the handles to complete. To make those, however (strips of suede cloth wrapped around cotton belting) I needed my sewing machine—which lay under a mound of stuffed snowmen. Last weekend I finally unearthed the machine and joyfully made my two straight-sewn lines (yep, that’s all I needed it for). The incredibly difficult part came after I slid the belting inside the suede cloth sheath—I needed to hand-sew it around the handle rings. Sigh. It helps to have the right tools when doing a specific task. Somehow I managed to sew one side of a handle around the first ring with your run-of-the-mill sewing needle—and also managed not to injure my fingers in the process. Try as I might, however, I could not get that needle to go through the belting and suede cloth for the second ring. So off to Joann’s I went the next day to buy a needle specifically made for working with leather. After that, the sewing went easier. Easier, but not necessarily easy. My middle finger suffered a nice puncture wound from that needle (anyone seen the tip of a leather needle? It’s huge compared to the teeny-tiny points of your average sewing needle! ), but thank the Lord for Neosporin. That stuff is amazing at numbing the pain! I’m hoping the bag will be able to come with me when we travel this upcoming summer…since that’s why I set out to make it in the first place. I say “hope,” though, because the thing is bigger than I anticipated and we’ll be traveling by airplane, so I have to wonder: will the flight attendants let me take it into the cabin of the plane? Because after all the work I’ve put into it, it sure as heck isn’t going into the belly of the plane! Have bag. Will travel. Almost. I’m on vacation for the next few weeks. When you think of the word “vacation,” what first springs to mind? Maybe relaxation. A time to unwind. A yummy drink in one hand and a good book in the other. Or maybe it means going to new places, seeing new sights, doing something different and fun each day. For my family, it means heading back to New England to visit friends and relatives. And for me specifically…it means not having to worry about what we’re having for dinner, because I don’t have to cook it! 🙂 It also means time to knit (since one can socialize and knit at the same time). What is doesn’t mean is time to write–hence why it’s been just over two weeks since my last post. Nevertheless, today I’m squirreling away here and there in order to share my progress on the one thing I’ve been able to work on this past week: my Ravenna Satchel. Last row of intarsia panel complete! Roughly a week after I published the last post about the satchel, I finished the intarsia panel—yay! As the end came in sight and the number of color changes I had to make began to dwindle, the knitting process naturally sped up and it became a breeze to finish one row after another in one sitting. And oh, the smile that lit my face when I knit that last stitch! Then I saw the loose ends. I can’t say my smile entirely disappeared. After knitting intarsia for so long, I found it rewarding to do something different. It took me a few blocks of time, but one by one those loose ends got weaved in. 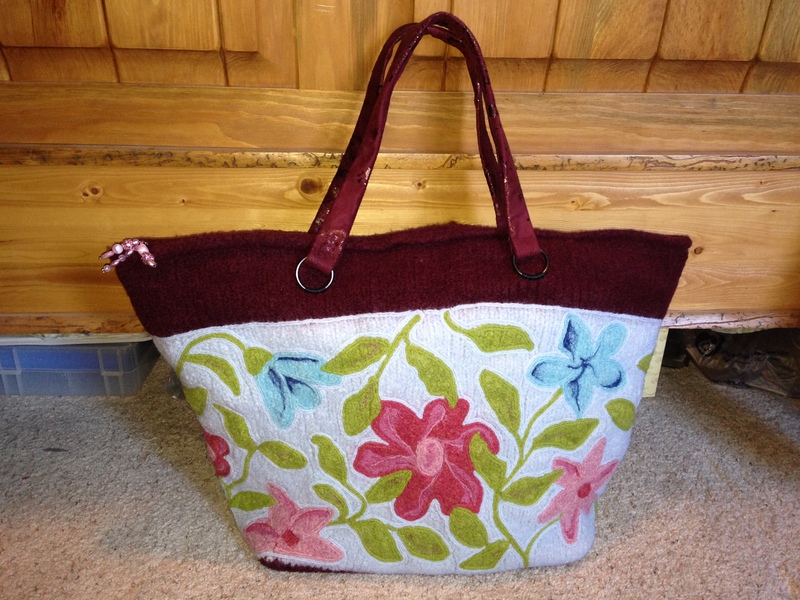 Once I fixed some random holes left by unwrapped stitches, I turned my attention to knitting the back of the bag. In the original pattern, the back is solid black—a bit of a letdown, given the rest of the bag is so beautifully patterned with flowers and such—but I had long ago decided I’d carry the blue background all the way around and ordered yarn accordingly, buying more skeins of Clarity (light blue) and less of Currant (deep red). Apparently I did not have my fill of intarsia, for I had knit no more than a few rows into the humdrum straight-stitch back panel when I decided to design a couple of flowers and possible leaves to liven things up a bit. Common Sense returned in time to [redirect] my grandiose plans into a more manageable one: one flower and one leaf. That kept me happily knitting for another couple of mornings, until I finished the specified number of rows and joined everything together again to knit the upper section of the bag in the round. That went quick and just before leaving for vacation, I had completed everything but the bind-off edge. So I sacrificed a critical couple of pounds in my suitcase and took the satchel-in-progress with me. I felted it within the first few days of arriving in New England. During the knitting process, I had been concerned about possible puckering in the areas behind which I chose to carry yarn; however, I’m pleased to report that puckering did not occur. Some of the darker colors did bleed a tiny bit, but it’s nothing the needle-felting can’t hide. After felting. 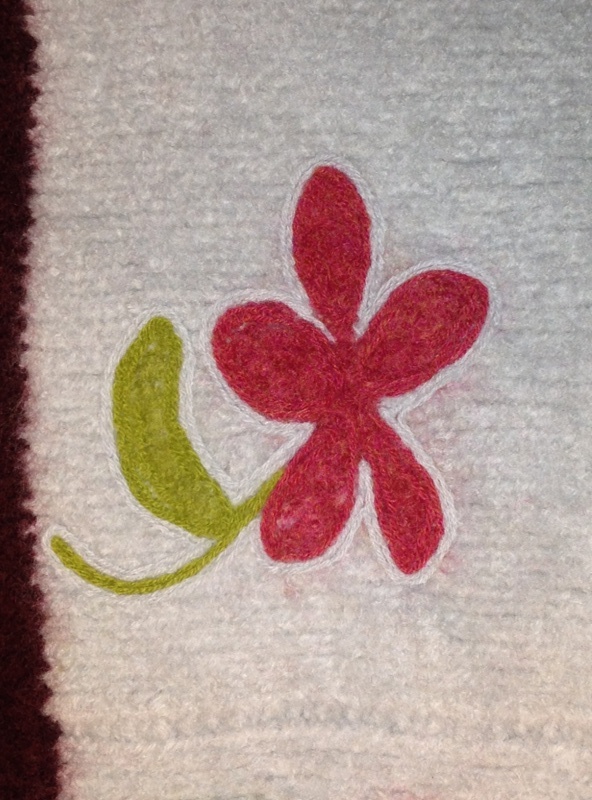 No, the picture is not out of focus–that’s the blurry effect of the stitches. Which is really what my fingers have been busy with this week. Following the pattern instructions and taking needle in hand, I outlined each flower and leaf twice with the corresponding yarn and now I’m currently outlining the outline twice with my background color. (Long car rides and evening chats afford great opportunities to stab away at strands of yarn.) As you can see from the flower and leaf I knit on the back panel, it’s the process of needle-felting with the background color that really makes the pattern pop. Once I finish the outlines, I’ll fix any last troublesome areas by needle-felting over it with the correct color. And when I’m done with that…uh, no, I won’t be finished. There’s a zipper to add and handles to make, feet to apply…and a search for the perfect fabric to line the inside that will make me smile every time I open my bag. So about a week ago, I reached the mid-way point of the intarsia pattern of the Ravenna satchel and what keeps running through my head is the slogan to a TV commercial that used to air when I was a kid: Calgon, take me away! For I am overrun by strands of yarn and self-made bobbins. As one woman so aptly writes in her project notes on Ravelry.com, the Ravenna satchel is not a traveling project. The farthest my own satchel-in-progress has traveled is the few feet it takes for me to pull it from its perch on my sideboard to the nearby floor, where I then sit with skeins of yarn, my accessories bag, and the intarsia pattern sprawled around me. I barely move until I’ve accomplished the two rows I’ve set out to knit each morning. I admit while there have been a time or two in which I’ve accomplished at most four rows in one sitting, it usually takes me anywhere from fifteen to thirty minutes to knit one row. It all depends on how many times I have to stop to add in a new leaf or flower bobbin (which requires counting the stitches in the pattern and measuring out the correct length of yarn), fix stitches that have been pulled too tightly when switching colors or advancing a row, untangle the random bobbin, transfer yarn from one hand to the other, etc, etc. Please tell me I’m not the only one to plod through this part of the pattern! Considering this is the first time I’ve attempted intarsia, I may have—to use a tired cliché (my apologies, fellow writers)—bitten off more than I can chew without a lot of grumbling and swearing. (Uh, Mom, you can ignore that last bit.) I’ve done two-stranded color work before, where the non-working yarn is carried behind the working yarn, so I understand the need for wrapping the strands together to prevent holes in the pattern. And because I’m able to knit both Continental and English, the transition between colors is not an issue, either. What is my problem, then? I believe it’s the plethora of green leaves in the pattern that makes me see red. Here is the thing about intarsia if you’re going to do it correctly: intarsia means you don’t carry the yarn behind your work, so if you are knitting a pink flower on a pale blue background, you need one bobbin of pink yarn and two bobbins of blue yarn—a blue bobbin for each side of the flower. Each bobbin, then, not only represents dangling strands of yarn prone to tangling, but also a starting and stopping point, i.e., loose ends with which to grapple during the knitting process and weave in at the end. Oh, joy! In the lovely Ravenna satchel, we have twenty-nine leaves and seven flowers, to say nothing of the background color interspersed between them. That means we have…no, I can’t do the math; I’ll start to cry. But I think you get the picture. If not, look at the one below, taken almost two weeks ago. I think if it weren’t for the many leaves, knitting this section would prove much less frustrating and taxing. It makes me wonder how the bag might look if one simply added all those leaves via needle-felting at the very end. Maybe someday, once I’m fully sane again, I’ll try it with a new mix of colors and report back my findings. About six months ago, I realized I could use a new travel bag—you know, something to bring on a flight or the occasional overnight trip—but I wanted to knit one for myself rather than buy one. So once again I visited Ravelry.com (love that site!) and I stumbled upon the Ravenna Satchel by Marta McCall. I swear the Halleluiah Chorus started playing (or maybe that was just the Christmas music in the background at the time), for even though it would take another several weeks before I purchased the pattern, I pretty much knew that was the bag I wanted to knit. I hesitated forking over the money for so long because the pattern itself is $12—a hefty price tag for me when it comes to a knitting pattern. The written instructions, however, arrived on thick, heavy sheets of paper, almost like cardstock, with large, glossy pictures; I’m hopeful these sheets will survive the dozens of shoves and pulls they’ll undergo in my knitting bag as I refer to them over and over again. The other reason I took a while to make a decision was because I had to be sure I wanted to spend sixty-plus dollars of my birthday/Christmas money on wool yarn. (Very thankful for Knit Picks Wool of the Andes, otherwise the cost would have been higher!) In the end, because I really wanted to do another felting project that included needle felting and the bag looked soooo inviting and original, I just could not say no. Before I ever ordered yarn, however, I did what many knitters decide to do on a project: change the colors to better fit my style. So to the Internet I turned for ideas, where I stumbled upon design-seeds.com (I highly encourage anyone who is contemplating colors and their complements to check out this site!). Amazingly enough, once I chose my color scheme, I was able to match all six colors with skeins of yarn from Knit Picks Wool of the Andes—which has over one hundred color choices!